A friend of mine had a potbelly pig named 'Calvin Swine' and I must say, Calvin was the most intelligent animal I've ever met! Calvin would constantly outthink his doggie pals, (for examples, check out my previous article, "A Snort Above The Rest - A Pig's Tail") but just how smart are swine, in general? Some people will tell you that swine are smarter than dogs; others will tell you that swine are smarter than dolphins; still more will exclaim, "Why, swine are even smarter than a 3-year-old kid!" What's more, Sir Winston Churchill once famously said, "I am fond of pigs. Dogs look up to us. Cats looks down on us. Pigs treat us as equals." But what is the actual truth when it comes to piggy intelligence? What have we uncovered about pigs over the past few decades? Plenty! The study of pig cognition has revealed much information about swine and how they think and live. An experiment previously only given to Rhesus monkeys and chimpanzees had been administered to pigs and the results had been quite amazing. Pigs had been provided with special joysticks they could control with their mouths or snouts. The pig would have to move the cursor around on the screen and make contacts with various targets—and they did it! Other tasks had pigs responding to visual clues. They were given odor quizzes where they had to correctly pick out various scents. These studies show us how important scents are to pigs. If you'd cover up a part of a pig's face they would have trouble with recognizing other pigs because that's where they emit a particular pheromone. Research in food location indicates that pigs may have a "dark side" in the area of deception and exploitation. On the experiment's first run, a small pig was confronted with the choice of locating buckets, some of which were filled with food. On the second run, the food remained where it was but the small pig was now accompanied by a much larger pig who didn't know the food location. However, when the larger pig discovered the location of the food, the smaller pig would get nudged out of its feeding time. After a few times of getting bullied out of their meals by the big pigs, the smaller pigs became deceptive and would go to their meals only when the bully pigs were heading in the opposite direction or when their backs were turned. So the small pigs learned that they were actually being taken advantage of and in turn developed deceptive tactics! Of course, this could also mean they learned that bad things could happen if they were near the bully pigs at feeding time and not the results of sophisticated cognition at all. Pigs can remember locations, negative and positive experiences, and the differences between individual pigs and humans. They can even recognize themselves in mirrors and learn from another pig's experiences! Their social structure is not unlike the elephant and like primates and humans, they have an increased prefrontal cortex. They also forage and eat meat. • Pigs have long term memories. • Pigs are adept at maneuvering through mazes and other tests where they must locate objects. • Pigs can learn complex symbol combinations for actions and objects as well as comprehending a simple symbol based language. • Pigs love mock fighting and love play like dogs and other mammals. • Pigs live in social communities. They keep track of individuals, learn from and cooperate with each other. Pigs can also utilize a joystick to move an on screen cursor (much like the chimpanzee) and use a mirror to find hidden food. 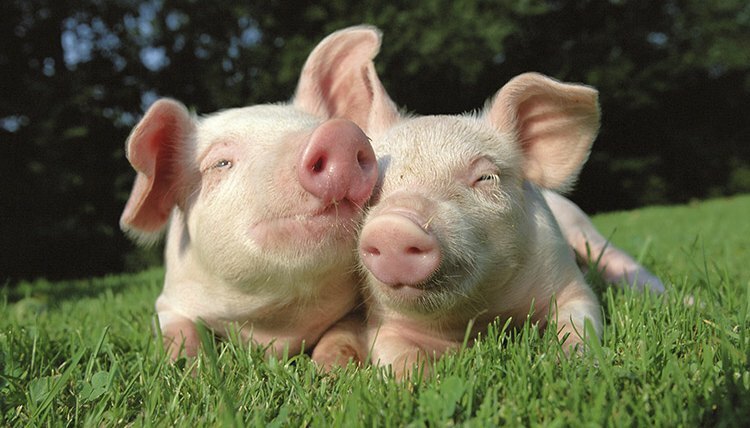 • Pigs exhibit empathy when in another individual they witness the same emotion. So with all this information about the intelligence of pigs, I'm having a difficult time (especially since I'm a big fan of pork) thinking that pigs are just a meat source! To learn more, I highly recommended that you read the paper “Thinking Pigs: A Comparative Review of Cognition, Emotion, and Personality in Sus domesticus" by Dr. Lori Marino, and Prof. Christina M. Colvin, published in the International Journal of Comparative Psychology.